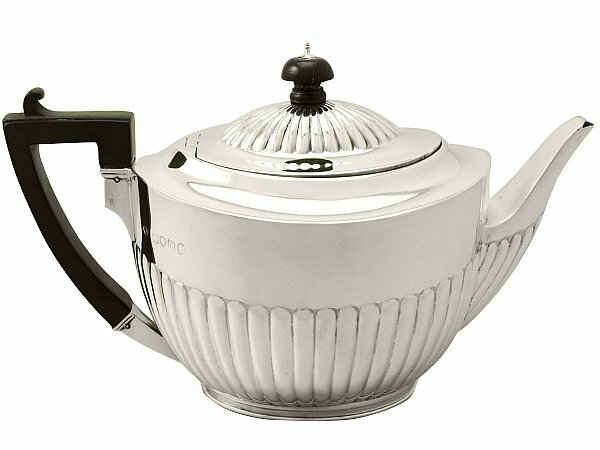 This fine antique Victorian sterling silver teapot has been modelled in the Queen Anne style onto an oval colet foot. The lower portion of this Queen Anne teapot is embellished with embossed fluted decoration. This antique teapot is fitted with a flush hinged domed cover, which features further fluted decoration; the flush hinge indicates the fine quality of this piece. The cover retains the original carved painted wood and sterling silver finial. This fine teapot is fitted with the original plain angular carved painted wood handle featuring a scrolling thumbpiece. This Queen Anne teapot has a plain spout, ornamented with fluted decoration to the underside. The teapot was crafted by the renowned and collectable London silversmiths Walter & John Barnard. Read about the anatomy of a teapot here. This antique teapot is a very good gauge of silver, fine quality and in exceptional condition. Full hallmarks struck to the surface of the teapot have surface wear in keeping with age and due to location, but remain legible. The part hallmarks to the interior of the cover are very clear. Length from back of handle to tip of spout 23.8cm/9.4"